Great device for on the road or in remote situations! Especially like the long cord? I was anxious to receive the reeljuice and never got to see how it worked. It was suppose to be fully charged taken out of the box. It wasn't and would not charge. I was suppose to get a wall charger with it as well and DIDNT. Very disappointed in the product! Charge your device up to five times—twice as fast—with this rapid portable charger. 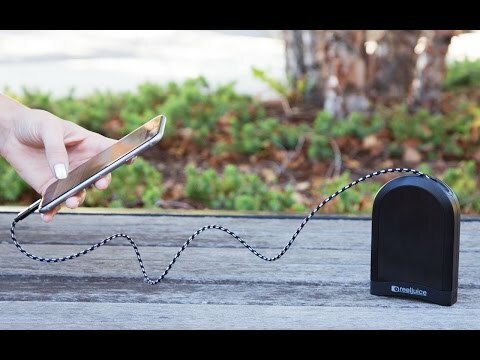 Extend Reeljuice’s retractable four foot cord to charge on the go. When you’re done, the cord reels back inside with a tug. There are no moving pieces, lose ends, or cables prone to tangle. Its intuitive circuitry detects how much energy your phone needs, then delivers the exact amount—quickly. And the pass-through charging feature lets you charge both it and your device at the same time. Maker Bob Martin designed Reeljuice to be an indispensable travel companion. Carry it in your backpack and use the extendable cord to text on the go. Or power up you and your friends while on a trip. Interchangeable micro-USB and Apple lightning tips make it suited for a family or group.